The foundation, roof and gutters are three essential elements to consider when planning to renovate your barn. Many problems could happen when you couldn’t anticipate it, even barns look in great shape could carry potential risks behind it. NEED MASONRY REPAIRS? STARTING A NEW PROJECT? Tip #1: Examine the foundation. First and foremost, be sure the foundation of your barn is perfectly solid. Some of the barns have shifted over time and become insufficient as they were built on rock substructures. If the foundation is solid and the ground that the barn sits on hasn’t washed away from the supporting pillars, then you’re in good shape. Some companies are expert at fixing problems for barns foundation in poor condition. However, don’t rely on quick fixes or temporary solutions. The repair may look great for a while, but it almost likely will breakdown. It might lead to something even worse. If the repair is done properly, you can add another 100 years for your barn. · Check if the structure’s foundation is solid. · Look for standing water. · Inspect the mortar of the stone. Tip #2: Critically assess the roof. In the past, roof coverings on agricultural buildings have a number of types from wooden shingles to slate and early metal to asphalt shingles and modern metal. Therefore, requirements for maintenance and repair for each of them would be different, but all have the same purpose that help your roof can last for years if maintained properly. For small roof problems, a spot fix can be sufficient. However, for bigger issues, always consult a licensed barn builder who is well versed in both repairs and replacements. If you are reading this and need help with your barn, we are here to help you. Let’s contact the experts at Royal Masonry now!! · Look at the roof from a distance. · Zoom in close to evaluate the details. · Inspect it from inside. Tip #3: Evaluate the gutters. As you know, the strong and watertight roof with good gutters is your best tool to against negative aspect could happen for your barn. Barns will definitely need good gutter systems to collect the storm-water that lands on the roof and guide it away from the barn to prevent damages, such as the structure and the foundation, as much as possible. 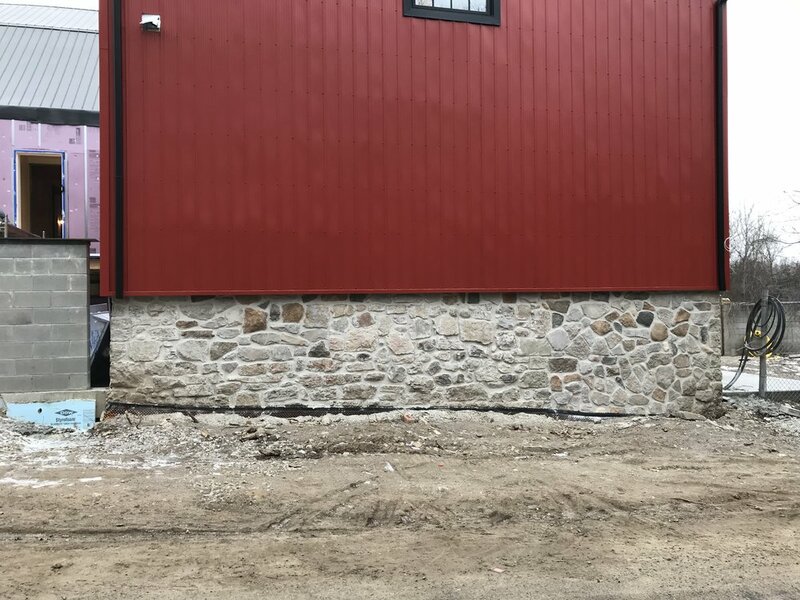 Any problems with the gutter are the least expensive to fix in consideration of barn renovation, but if it is neglected, the results could be worse. · Trace the path of gutters and downspouts. · Check for other gutter-related complications. If you wanted to ensure everything is okay, take time to walk around the barn sometimes, from inside to outside. Makes sure it’s sturdy, not wobble and not any hidden damages. There also should be no movement in the loft floor and if there is, you need to reevaluate before diving into a renovation. 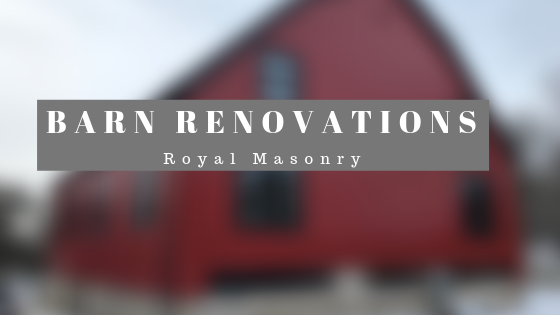 Work With Royal Masonry Today For Barn Renovations! The team at Royal Masonry has built a solid reputation for superior customer service and the highest quality stone masonry craftsmanship in Southern Ontario. Our mission is to provide you with the best quality workmanship at the right price. You can be certain that we will get the job done right the first time. Our professional approach and superior customer service mean that you can relax in the knowledge that your project is in safe hands. Trust the experts at Royal Masonry with any masonry service you require. Contact us today and find out for yourself why our customers highly recommend us to their friends and family. DO YOU HAVE A MASONRY PROJECT IN MIND? Are your finances ready for a big home repair bill, or would you end up in debt if your air conditioner suddenly broke down or the roof sprung a leak? More than half of Canadians would be unable to pay the bills if they were hit with a $200 emergency, according to a 2017 report from Global News, but a typical home repair can cost thousands of dollars. And if you don’t take care of home repairs in time, problems will only grow more expensive. Planning for home repair costs is an important part of being a homeowner. Home maintenance keeps your house running smoothly, protects its value, and prevents minor issues from growing into big, expensive problems. Unfortunately, many homeowners don’t think about this expense when they’re calculating how much a home will cost. Minor home repairs are financially manageable even if you haven’t planned ahead. Paying for a pest service, drywall patching, or another minor repair might tighten the budget for a few weeks, but it won’t launch your family into financial ruin. Major repairs like roof replacements, on the other hand, could affect your financial security for many years to come if you’re not prepared. According to HomeAdvisor, the average cost of a major repair or renovation is over $10,000. If you don’t have that amount in your rainy day fund, you’ll have no choice but to go into debt to fix your home. Debt can be a great financial tool when used responsibly, but high interest rates on credit cards and personal loans put many families into a cycle of debt they simply cannot escape. Home repair costs should be calculated into the cost of owning a home. If you save extra money each month after making the mortgage payment, you’ll be ready when something inevitably breaks or falls apart. The amount you need to save depends on the age and condition of your home. One common rule of thumb recommends saving 10 percent of your home’s monthly mortgage payment every month, but you may need to save more aggressively if your home’s major systems are nearing the end of their usable life. If your home needs a major repair before you’ve built an emergency fund, debt can help close the gap. But what type of debt is best for home repairs? SoFi advises avoiding credit cards for big repair expenses, opting for a low-interest personal loan or home equity loan instead. Your choice of contractor has a big impact on the price you pay for home repairs, but not in the way you think. Bids will vary somewhat from contractor to contractor, but since the specifications of the job stay the same, quotes shouldn’t vary dramatically. When one contractor comes in significantly lower than the others, it’s not a sign of a good deal — it’s a sign that the contractor plans to cut corners, saving themselves money at your expense. That means the biggest difference in contractor prices comes from workmanship. A low-priced bid saves money now but costs you later when the work starts falling apart and you have to make repairs sooner than expected. Poor quality work from a cheap contractor also affects the aesthetics of your home. If you want high-quality work that looks great and maintains its value, it’s worth spending more for a highly skilled and detail-oriented contractor. Remember: When it comes to your home, you get what you pay for. Your home is your biggest investment, so shouldn’t you protect it? By creating a rainy day fund for home repairs and choosing contractors who will do the job right, you ensure your home remains beautiful and livable for years to come.